Fortunately, there's something we can do about this desecration of an American breakfast tradition. And it can be done while also trying to prevent millions of people from getting health care, thus killing two — or possibly 30 million — birds with one stone. A brave group of tea party Republicans has decided that the best way to get rid of Obamacare — since voting to repeal it 39 times doesn't seem to be working — is to not fund the law. Heroes like Sen. Mike Lee of Utah, Sen. Marco Rubio of Florida and Sen. Ted Cruz of Hateseverythingistan say they'll oppose any budget that gives money to the health care law, even if that means risking a government shutdown. This is similar to when Abraham Lincoln famously avoided an American civil war by holding his breath until the South agreed to free the slaves. The tactics of Cruz and company have been praised by many Republicans, including North Carolina Sen. Richard Burr, who called it "the dumbest idea I've ever heard." In a recent speech, Cruz said that the Obama administration's tactic is to "get everyone addicted" to Obamacare, thus making it impossible to abolish. He's right. Outside of caffeine and cocaine, there are few things more addictive than access to affordable health care. My guess is this is the same trick Jamba Juice has up its hemp sleeve. The company — clearly a radical left-wing group of nutrition Nazis — has co-opted something all Americans want (oatmeal) and is using it to get us hooked on smoothies that will turn us into dope-smoking pacifists. So today I call on Sens. Cruz, Rubio and Lee to not just demand the defunding of Obamacare, but to hold the country's budget hostage until Jamba Juice promises to take its mitts off our oatmeal. The defund movement has gathered enough big names (all the assumed GOP presidential timber - which says something about the field) to make it newsworthy for that fact alone. But saner voices are coming forward to point out some flaws with this strategy. Like lowering expectations. SK: What do you expect the Obamacare rollout to be like this October? I have a sad suspicion we are heading toward a total meltdown on the right as the divisions in the GOP make any legislative action impossible. This includes a farm bill, BTW. Before I can go back to being a smartphone user. I sorta drowned my iPhone in the pool two weeks ago, and...it's a long sad story soon to be a FJ John's World. Anyhoo, I find myself singing. Is that the Department of Commerce works to get better, unlike the Dept. of Ag (NASS - I'm talking at you). The big picture is this: Recalculating the treatment of all “artistic originals” that fit the bureau’s definitions would have increased the economy in 2007 by about $70 billion, or 0.5 percent. And R.& D., particularly in the field of biotechnology, would have added more than $200 billion. Combined, these two changes would have swelled G.D.P. by almost 3 percent, Mr. Kornfeld said. How it will affect G.D.P. this year and in the restatement of past numbers was being calculated as we spoke. Brent R. Moulton, the bureau’s associate director for national accounts, said the statistics would be out this week. He noted that other nations had been making such shifts as well. But the bureau’s changes will widen the gap between corporate and national economic accounting, said Baruch Lev, a professor of accounting and finance at New York University. Despite the change in G.D.P. accounting, he said, R.& D. is still generally treated as an expense, not as an investment, in calculating profits and tax liability. I would offer that even our ancient sector is subject to changes in wealth creation and structure. Yet doing things we've done them since we used pencils (and no faster!) is ingrained in our government monitor. As more of our economy arises from intellectual and seemingly ephemeral goods/services, better acknowledgment of this change in the statistics will guide policy toward better outcomes. It also prevents undue emphasis remaining on tangible production as "real" and deserving more favorable treatment. *I think I'm going to use this apt acronym for the Department of Ag more often. I think this beats those FB, NCGA, et al pre-written e-mails, letters, cards, etc. all hollow. Capitol Bells Demo from Ted at Capitol Bells on Vimeo. Animal ag is still fumbling for a workable answer to animal welfare activism and more importantly customer concerns reflected in their markets. I had not thought about it much, other than noting there seems to a tide of sorts in consumer opinion and it is not flowing the direction the protein sector necessarily wants. Look, I confess to hypocrisy. I eat meat, albeit with misgivings, and I have no compunctions about using mousetraps. So what? We have the same inconsistencies, controversies and hypocrisies in dealing with human rights. We may disagree about waterboarding terror suspects, but almost everyone shares a revulsion for genocide, the use of poison gas or the torture of children. Now we are plodding along a similar controversial, inconsistent, hypocritical — and progressive — path on animal rights. We may disagree about eating meat, but growing numbers share a disgust for extreme behavior, like the force-feeding of geese (now banned in California) to produce pâté. We as a global society have crossed the Rubicon. We disagree about where to draw the line to protect animal rights, but almost everyone now agrees that there is a line to be drawn. I think he has nailed one thing: we have turned a corner and are now engaged in where, not whether to draw the lines. I also believe we are beginning to get some ideas in the protein sector of how to coexist with such limitations. Smithfield is still producing hogs even as crates are disappearing. It is similar for enhanced cages for layers. Critics see this as the nose of the camel, but I think that analogy has become useless. Such actions are the exact response a free market generates to maximize outcomes for all. The heightened sense of entitlement by farmers obvious in the current farm bill debate. There is no way 'round the realization we commercial grain farmers are in the economic elite and have been for a few years. I'm sure these attitudes are pervasive in our ranks as we speak. But my neighbors are worse than I am, of course. BTW, this attitude drops away as farm programs disappear. Over 10 million viewers per episode - better than all but a handful of US programs, such as Big Bang and NCIS Topeka, etc. But unlike our reality TV, it shows people NOT at their worst, so breaking with our tired reality formula. To keep audience attention, the hosts like to goof around — doing little dances, teasing each other, running around in the pig pen. Nobody is yelling; smiles abound. After each episode, you can text the show’s creators and request a brochure on any topic covered. Four to six thousand brochures are now sent out each week, with numbers steadily increasing. IMHO, this effort will do more for the poorest Africans than dozens of industrial farming efforts to make Africa another Brazil. Is this libertarianism's high water mark or just a Rand Paul failure? Accidents happen. But a lot more often in the country. Can we get labor markets tight enough to finally lift wages? Will share rent make a comeback? I say no. Big excitement today - new blades on the batwing mower! Shifting the farm operation to Aaron. This has proven mildly complicated but we are moving forward with rental ground renewing under his name, experimenting with machinery transfer/rental schemes, and getting a handle on what my contribution needs to be. Forming a joint operation with a neighboring family with a similar family structure. Begun this year, it has exceeded all my expectations and we are rapidly finding ways to exploit more efficiencies and adapt. Preparing for retirement economics. Our goal is to have minimal income but still be able to backstop Aaron with cash rent adjustments on our own ground to help him to weather difficult times or take advantage of unexpected opportunities. Our effort to transfer assets and income to our sons has been in place for some time, but I'm still trying to get my head around how to adapt to a new leaner economic status. Profligacy turned out to be one of my core skills. Completing the income tax hangover cure as my farm income drops and depreciation becomes a thing of the past. See also "machinery" in #1. One more year should get me past this economic time-bomb. $4 corn doesn't help, BTW. Slight adjustments at US Farm Report - I'll be taking more time off - as well as fewer speaking engagements (maybe 4-5 per year). Bluntly put, I'm tired of the road, even with clearly generous compensation. FJ has been very kindly flexible, and I'll still be writing for TP and FJ as usual. Get maybe one more major trip/cruise with friends accomplished before any or all of us no longer are capable or interested in traveling. This can happen much sooner than we want or expect, I have learned this year. Free up more time for woodworking, church, supporting friends and family during tough times like illness, and doing more Grandpa stuff. Plus Jan and are both more keenly aware the time we have together in good health may not be as unending as we had always assumed. This year has seen a spate of heartbreaks for couples we care for and we are rethinking our own time allocations. Like most farm couples, we have gotten used to enormous chunks of time together, and we no longer take them for granted. I will be participating in the Good Judgment Project this year. It will take considerable research time on my part. This will affect Incoming, of course. I will share my results and more info on the blog. Maybe collect and self-publish my columns - humor for sure, but perhaps the commentary as well. While I sorta saw all this stuff coming, the social and economic context keeps shifting even as we work through the issues. Many of the these developments were unexpected and the future undoubtedly holds more surprises we can't imagine right now. Here is the deal for you guys. Looking at December 2014 (when I turn 66, hint, hint) as a major milestone, I will try to post at least 1-2 times per week until then. But I love blogging and once I'm home more will target about then to return to 1-2 posts daily. I have yet to decide how to handle the growing paywall problem for bloggers at WaPo, NYT, WSJ, Sullivan, The Browser, etc. I think it is reasonable for me to expect to invest a chunk to have full access, but you guys should be able to follow the links for free. Bottom line is I will continue to post fitfully for a few months with a return to full-blown blithering around the end of next year. Thanks for reading and your friendship over the years, and I look forward to your inputs and put-downs as I opine on just exactly how the world would be if I were King. Has moved to the city. Numerous economic mobility studies seem to be pointing toward a clear conclusion: If you want to get ahead in the US, move to town - or better yet a dense city. The effect is so pronounced it shows up in sprawling suburbs as well. There's an old vision of the American Dream that is obsolete, and has been for quite awhile. That's Thomas Jefferson's idea of a nation of self-sufficient farmers -- an agrarian republic. Over time, as people left the countryside for the cities during the Industrial Revolutions, this vision morphed: it became a nostalgia for (and even snobbery of) small towns. It's a vision that Republicans still cling to. Remember when Sarah Palin talked about "real America"? Or when Republicans warned that high-speed rail and bike lanes were some kind of socialist plot? It's a vision of America at odds with the American Dream today. The reason this is more than a cultural curiosity is the political impact. Part the the mantra of the right is "takers" simply won't get off their butts and climb the ladders of success by working hard and sacrificing. There is an element of truth in this, but it ignores the fact there are few ladders left in many parts of America. Still, earlier studies have already found that education and family structure have a large effect on the chances that children escape poverty. Other researchers, including the political scientist Robert D. Putnam, author of “Bowling Alone,” have previously argued that social connections play an important role in a community’s success. Income mobility has become one of the hottest topics in economics, as both liberals and conservatives have grown worried about diminished opportunities following more than a decade of disappointing economic growth. After years of focusing more on inequality at a moment in time, economists have more recently turned their attention to people’s paths over their lifetimes. This theme that The Great Stagnation means life is about as good as it's gonna get for the vast majority of us informs every decision we make to some degree, shapes our political expectations and transmits a questionable message to children. But more and more, I think it's not wholly unfounded. Overall economic growth faces some powerful headwinds. In fact, if the long-suffering doomsayers of agriculture finally hit it right over the next few years, and income and land prices plummet, farmers may be among the pessimists more so than today. Our industry and profession has pulled up many of the traditional ladders by which farmers climbed in the ranks. Remember hogs as the great mortgage lifters? It was a way to increase income without having to expand your land base. I think I am not far off in suggesting that path has at least narrowed significantly. As for renting more land, good luck to those who can't bankroll the cash rents with equity or other ground. Moreover as tracts become larger due to consolidation with adjacent land buyers, the chunks won't be as digestible as an 80 here or there. Other sheer good fortune, which cannot be ruled out, there are few obvious strategies to enable ambitions to be fulfilled in farming. The one emerging possibility could be working at entry level for a large farming operation and climbing up an internal ladder similar to any other large corporation. Perversely enough, this could be the most powerful argument for large farms: they offer the greatest hope to young aspiring producers - just not a traditional independent career. Finally, we're not about hard physical labor as much anymore. Ag is about capital and technology. Especially on the upcoming retrenchment, access to capital won't be east for climbers, and will be met with fierce competition by those they would replace. In short, while there may be some culling of the farmer herd on the backside of this boom, our lack of upward mobility means it's likely few of the survivors a decade from now will be anyone but a scion of those already in the upper ranges of income and size. Just like, if not worse than the rest of America. Yes, Iowa is really like that. This is almost worth buying a gun for. Maybe I could finally watch hockey. OMG - think what this will do for golf!! All that NG, and nowhere to go. Even the best conservatives seem to try to embarrass us. Actually, Farm Journal has been in front of this problem, and is doing well. Cash rents may be too high? Who knew? The end of the Glyphosate Era is at hand, I predict. Perhaps it was wishful thinking, but my previous conviction concerning global population growth just isn't panning out. I was convinced continued economic growth would trigger lower fertility rates pretty much everywhere, but it's looks like Africa remains the exception. This just in: Humanity is growing faster than we thought. --Nigeria, the West African nation slightly larger than Texas, is on track to surpass the United States as the world’s third-most populous country by 2050. 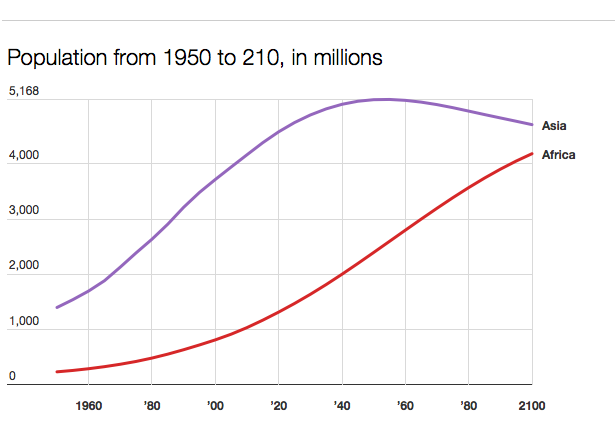 The size of its population may rival that of China by the end of the century, unless something dramatic happens. --The number of people living on the African continent is set to nearly quadruple by the end of the century, rather than merely tripling, as previously projected. 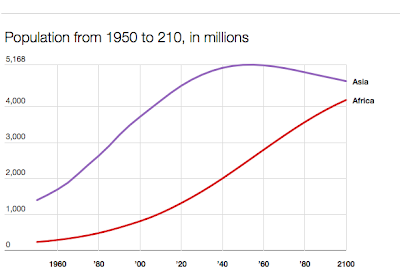 --The world’s population is on track to reach 9.6 billion by midcentury and nearly 11 billion by 2100, which is 700 million more than was projected two years ago. The reason for the higher figures? A slew of recent household surveys in African countries revealed the average number of children per woman was higher than previously estimated, said Francois Pelletier, chief of the U.N.’s population estimates and projections section. A seemingly modest change from an average of four children per woman to five, he said, can produce a dramatic upswing in coming decades due to the power of compound growth. After yet another "demographic surprise", I doubt this is the last word, but still the evidence points to a much higher number for the end of the century that we now expect. It's a rare feat: a legislative action that infuriates virtually all parties involved. Kind of an anti-compromise, I guess. But that is exactly what the food-free Farm Bill seems to have accomplished. But of course, he is not a real conservative anymore, having been "frummed" out like like so many. But to make it easy, Chris Clayton at DTN has assembled much of the response from the hard right. My favorite rant (it was hard to pick) was by Derek Thompson. The farm bill passed by the House of Representatives yesterday is pretty much a disgrace. Republicans took legislation that had historically been 80 percent food stamps and 20 percent mostly awful and antiquated agribusiness subsidies. And they passed something that is 0 percent food stamps and 100 percent mostly awful and antiquated agribusiness subsidies. "Billions for farmers, nothing for the poor" is a stark assessment, but a fair one. “[T]he one explanation that almost always explains support for agricultural protection,” the paper concludes, “is the electoral pressure a legislator faces, i.e., the proportion of her constituents who are farm owners or farm managers.” Other things, like lobbying or a politician’s farm background, can also matter, but they have a weaker effect. This was unexpected. The average number of direct agricultural constituents in a House district was only about 1 or 2 percent — there simply aren’t many farmers left in the United States. But those voters care a lot about farm policy. And most other voters don’t care much about farm policy at all — and are unaware of the costs of agricultural subsidies. In an interview, Bellemare stressed that his paper is a work in progress — it’s not yet published — and he’s still responding to critics. For instance, it’s a bit tricky to analyze votes on the 2002 and 2008 farm bills because they contained both crop subsidies and money for food stamps. So the authors have used a variety of techniques to tease out lawmakers who are casting votes for food stamps and those who favor the actual farm subsidies. One notable thing they’ve found recently is that lawmakers with high levels of poverty in their districts are actually less likely to favor farm subsidies. This suggests that the traditional set-up of farm bills — where food stamps are included to create an urban-rural alliance — has in fact made it much easier for the previous farm bills to pass. Well, it's good to have some academic justification of something most of us considered obvious, but like the other comments, few have any idea of what happens next. In all, I think it was a monumental blunder by the House leadership and TP faction. They did not appease the far right - just the opposite. And they managed to split a sector that voted overwhelmingly red into bickering splinters. But farmers are mistaken if they think this approbation will be confined to Congress, I suggest. The AFBF has had the right of this for some time: Keep out of the spotlight at all costs. Without food stamps to distract, the awful truth about ag spending is made transparent. This move has tarred my profession with the same brush. And nobody - not even us - thinks we're going to work to add another food bill "later". So this is exactly what it looks like: My boys got me mine. Too bad about those other guys. All in all, I think odds just became slightly higher for farm program cost reduction and reform as the ag lobby in Washington has lost control. And getting even there will burn more bridges than we can imagine. While I am no fan of the cynicism, gerrymandering, and class-warring of Tea Party congressmen, if they can pull this off, they deserve credit for moving farm policy toward something saner and more equitable. Not only does the House intend to split the bill, but they also took aim at rooting out the "permanent farm law" from 1939 and 1948. This is no small ambition. The bill would also repeal laws from the 1930s and 1940s, essentially eliminating all old farm policy which some conservatives like. Farm-state lawmakers have kept those laws on the books so there would be incentive to pass new farm bills and avoid expiration, but the threat of outdated policies kicking in has been a headache for farmers who worry they can’t depend on Congress to create new laws or extend more recent versions of the law. But what I continue to consider the greater point is too much of agriculture has placed their future in the hands of hard-to-predict politicians. This is a major farm business plan blunder, because it introduces unpredictable, illogical catastrophic failures and broad economic dislocations. Dairy - the idea milk can't be produced in free markets is learned nonsense. In fact, we'd better start finding ways to do so. Cotton - I suppose alternative crops could get cheap enough to make cotton viable without subsidies, but that's a long shot, IMHO. Rice - we're not even close to global competitiveness most years. Corn - Although slipping down the list, the ethanol mandate loss would be a knee-buckling development. While the industry may have outgrown it, and energy economics may support its use, until we stop holding a gun to the public's heads, we won't know how to plan. To top it all off, while all eyes are on Washington, agriculture continues to be slow to respond to climate change. I think there is a naive belief magic seed will appear from Monstanto, et al. in time to cope with extremes of heat, drought, and rain. I'm actually coming to the other conclusion - that new genetics offer rising risks for different environmental conditions. The green snap problem seems to be a new side effect of modern genetics and guess which way storm intensitygoing. At any rate, whatever the outcome, this narrow escape with from loss of government goodies should shake the faith in this cornerstone of our ag business. Trusting Washington seems an odd thing to do for people who despise and distrust government. Who suffers from Parkinson's disease. At my age it's almost a certainty you will. We can only hope, but evidence likes this undergirds those hopes. Why we farmers are so angry about SNAP that we're risking shooting the horse we ride into battle for our subsidies. The program is an outreach by USDA to get to the 1 in 4 children living in hunger. It's still Saturday...and has been for 4 days, it seems. Those holidays in the middle of the week! A Mongolian Neo-Nazi environmentalist walks into a lingerie store in Ulan Bator. Oddly, not a joke. But it should be. Robot are taking our jobs. Indians have issues with neckties. Meanwhile, I'm lobbying for open collars on USFR. To no avail, I might add. Speaking of USFR, this isn't how we edit our video. No, no, not at all. One of the farm-bill killers was the last minute Southerland amendment. At 12:14 p.m., the House opened debate on an amendment introduced by Florida Republican Steve Southerland that would have allowed states to increase work requirements for citizens to receive food stamps. Shortly after, Cantor spoke on the floor in support of the amendment. While there were more than 100 amendments debated over the two days of deliberations, Southerland’s amendment was the first and only that prompted Cantor to take to the floor. At 1:22 p.m., the Southerland amendment was approved in a near-party-line vote, 227 to 198. Only one Democrat went for the amendment, and only six Republicans went against. It was a partisan poison pill, the last amendment of the day. And it was enough to kill the measure. At 1:54 p.m., the Federal Agriculture Reform and Risk Management Act, colloquially known as the farm bill, was defeated 234 to 195, with 24 Democrats backing the legislation and 62 Republicans voting against it. It was the last in a series of embarrassing defeats for the House Republican leadership, who have struggled for three years to corral the conservative wing of their conference. Speculation aboundson Cantor's motive, and I certainly have no insights. It doesn't look like something your No. 2 man should do unless he's itching to be No. 1, though. Indeed, the 24 Democratic votes were a clear drop from the 40 that Minnesota Rep. Collin Peterson, the Democratic floor manager, had predicted. “I did have more Democrats,” Peterson told reporters after the vote. He said the “last straw” had been a Cantor-backed amendment that opened the door to states imposing more work requirements on able-bodied food stamp recipients. Cantor sought to shift the blame back to Minority Leader Nancy Pelosi, accusing the California Democrat of choosing “partisanship over progress.” And Republican aides insisted that Peterson should not have been surprised by the work amendment. This is all water under the dam, so to speak.But what I found hilarious was this effort to explain how to make SNAP a work-tested entitlement. Under this new system, those able-bodied poor who needed public assistance and showed up at their local welfare office before 9 am would be assured a work assignment for 8 hours that day. They would be paid at the end of the day the minimum wage for that work in cash. If they needed more, they could come back the next day and work again. This is only for the able-bodied poor. The disabled who could not work would be served by other programs designed for them, which can provide generous assistance on top of Social Security disability payments without requiring work. The local welfare office would attempt to place those seeking assistance in a private sector job, like private temp agencies do all across America every work day. Indeed, ideally the local welfare offices would be contracted out to private temp agencies, which would be paid a fee based on successful placements of those seeking assistance in private sector jobs. But all those who showed up needing assistance would receive some 8 hour work assignment for the day paying the minimum wage, even if it was just to spend the day cleaning up the local public parks. Those who needed child care while they work would bring their kids with them to an on-site child care facility. All other public assistance for the able-bodied would be provided only in return for those who showed up for work in these job assignments. That would include Medicaid vouchers for private health insurance for those who showed up for enough days of work each month to qualify. [More]. Does anyone notice the slight problems with the above program changes? Isn't this potentially a 1930's scale work project like the CCC? The problem is not solely making people work, but finding any jobs for unskilled laborers. If the default is "cleaning parks" who will get people to the parks supervise, run the payroll, etc.? What will this government monstrosity cost? Try to make this plan work in rural America, where most SNAP recipients now live. How many offices would this require? Finally, won't the USDA suddenly become the largest day-care provider in the country overnight? Liberals have been arguing for this for decades, and here a hard right commentator reaches the same conclusion. Does this guy even know how SNAP works? Now I realize this whole pipe dream could simply be an effort to make getting food stamps so hard people don't bother. You make all these hurdles and don't fund any of the appropriations needed to make it work. I'm pretty sure, however, that the eventual court case would force the spending, just like ADA made all those ramps get installed. Last week during the news we has a report about the growing cost of the Supplemental Nutrition Assistance Program - SNAP - which used to be called food stamps.The video we used to illustrate the the story was of shoppers checking out using SNAP cards. While the video was essentially accurate, the shoppers were all African-American. During the week I did some research and discovered such images may inadvertently perpetuate inaccurate stereotypes. The most likely SNAP recipient is not an adult African American - it is a white child under 18. Children receive just under 50% of all benefits . Whites account for 43%, African Americans 33% and hispanics 19%. The growth of the program cost is largely due to growth in those eligible - a result of the recession and wage stagnation. Even so, the cost could be much higher as only about 3/4 of those who qualify participate in the program. Only 10% of SNAP recipients receive cash welfare payments, and the average duration of benefits is 9 months. Most surprising to me was that in the last few years rural use of SNAP has exceeded urban participation rates - the percentage of those eligible who sign up. These numbers and images matter because this year the ag budget will be fiercely debated between ag programs and food assistance. When farmers realize SNAP cutbacks will impact kids in their local scholl, not just adults in the city, they might decide to split those dollars differently. It is also germane, I think, to point out the fraud rate for SNAP is significantly below the rate for crop insurance and farm payments. And it bears repeating: economists have found changes in eligibility have been a small factor in the expansion compared to the recession and job losses. More importantly, SNAP costs will decline as unemployment improves, just like it was designed to do. Republicans don't show any evidence we know what we're doing on this topic other than pandering to the ill-informed right, but a good first start would be to add some actual knowledge to our decision-making process. If we do, we might find SNAP far down our list of wasteful programs - and certainly below farm subsidies.